With the prevalence of crime in America’s cities, it is essential that measures be taken for the safety of those who operate and use law enforcement vehicles or public transportation. Mobile surveillance companies are helping to take these measures through manufacturing surveillance equipment that can be installed and operated in vehicles. However, a vehicle’s battery does not supply the higher voltage level required to support this surveillance equipment. One major mobile surveillance company turned to Comtrol for a solution for this issue, and Comtrol recommended the RocketLinx® ES7106-VB. 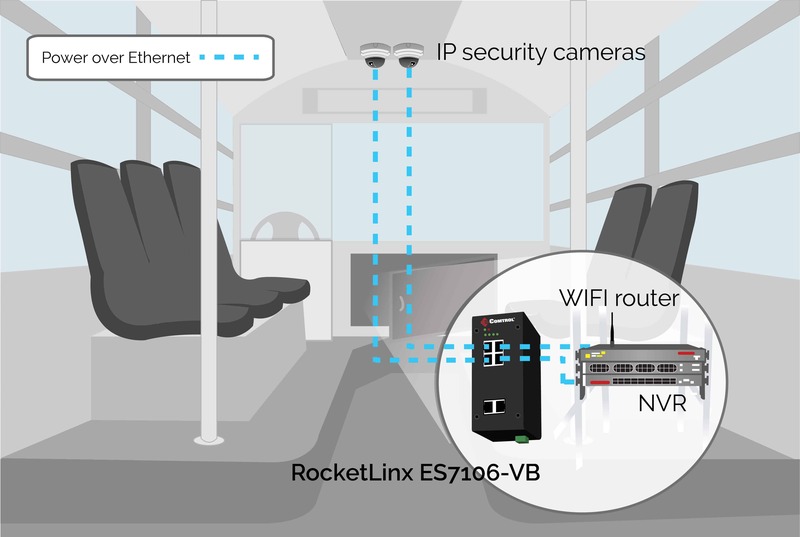 The RocketLinx ES7106-VB is an industrial Power over Ethernet (PoE) switch that includes Voltage Boost (VB) technology to supply power to equipment within a vehicle while continuing to receive and transfer data from the connected devices. The switch is powered by the vehicle’s battery and the VB technology allows it to “boost” power up to 48V to the other devices on board, such as IP cameras, WIFI routers, and Network Video Recorders (NVRs) via Ethernet. This two-in-one product was designed with precisely this application in mind, and the ability for the ES7106-VB to both power and connect to the devices within a vehicle was the determining feature for this mobile surveillance company’s decision. The RocketLinx ES7106-VB is a rugged, plug-and-play industrial PoE switch that can operate in a wide variety of environments. The ES7106 can operate efficiently in temperatures ranging from -25°C to +60°C. Additionally, it is protected by IP30 industrial-grade aluminum housing to preventing any water or dust damage. Comtrol’s RocketLinx line of products is a staple of our dedication to durability and efficiency; the RocketLinx ES7106-VB is a perfect example of these qualities. Comtrol’s RocketLinx Power over Ethernet switches are engineered for industrial, security, and transportation applications such as IP video surveillance and intersection monitoring, where the power source is not conveniently located. With rugged, drip-proof housings, redundant power inputs and performance command-line interfaces, these Power over Ethernet switches provide reliable networking solutions.